The list contains the train cars with the location of the train and if necessary with the assigned freight bill and its destination. The image of the selected cars will be displayed and its dispatching data can be edited in the "Operation" tab. By left-clicking on the image or "car card" button, the Carriage dialog opens read-only. 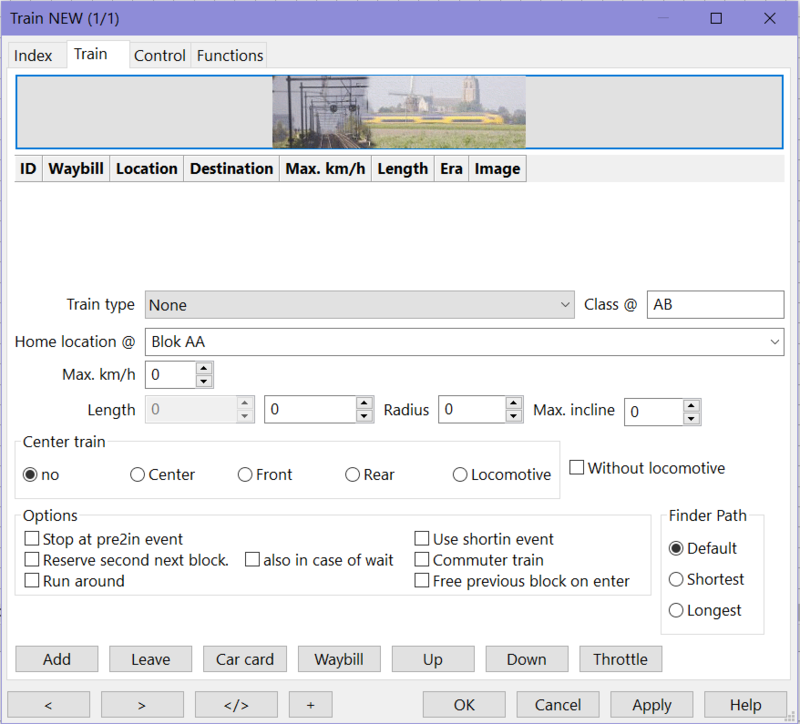 The type will partly influence the choice of a new destination block depending on the block settings and permissions as described Block and train type. If the train-type is set here, it overrules the train-type of the loco. The Train class used in Block Permissions. Optional block or location ID to use as the home of this train. If this value is less then the Block Max. km/h and/or Route Max. km/h it will be used instead. The second length field can be used when using trains without cars; Empty length. This number reflects the minimal radius of a train that can safely operate on curved tracks. Add a railroad car to this train. Leave/dispose the railroad car at the current location. Show the card/properties for the selected railroad car. Show the active Waybill or assign a Waybill for the selected railroad car. Move a railroad car in the list up or down. Opens the throttle for controlling railroad car functions.